It took an overtime period for the Celtics to dispatch the Suns 116-109. It was the most exhilarating game of the year. Can anybody recall a game where 4 of our 5 starters put up a bagel in the first half? If you participated in the game on thread most, took that first half dud with a grain of salt. I was never in doubt that the team could win and actually felt pretty good knowing that Boston could not possibly replicate their first half performance. It was a dreadful 1st QTR where Boston found themselves down by 19 points, 32-13. Our bench came in and righted the ship as the Celtics played even in the 2nd QTR 22 for us and 23 for them. Brad did something at the start of the 3rd QTR for the first time all year. He made a change in the starting lineup by inserting Marcus Smart in the game in place of Jason Tatum. That played immediate dividends because Smart's defensive presence is a game changer. Boston outscored the Suns 30-25 in the 3rd but still found themselves down by 15 going into the final quarter 80-65. It was back and forth for a while and with 7:16 remaining that Booker kid put them up by 17 points 90-73. Gordon drop a 3 pointer to breathe some life into the affair, making it 90-76 but that damn Booker was not to be denied scoring once again making it 92-76 with only 6:13 remaining. We were down by 16 points. The game stood with Boston down 14 with 3:45 left on a guess who, another Booker score. I kept thinking man we are right there but it seems like every inch closer we get we still are a foot away. It is at this point in the game that Boston took complete and total command of the game in a display of great execution and clutch scoring. This was a game that Boston was suppose to win. See my Up next post. But Boston continues to search for the right tone. An illusive sweet spot has been hard to find. I believe that we have the right ingredients to be a fantastic team but the recipe has not been perfected. There are those that believe they do not need time for adjustment because they played together last year but that is simply not true. Last year the Celtics opened up with a 3 wing lineup, a PG and a center. Last night was the 11 game with that configuration and same the same players. We really do not know if it will work and neither does coach Stevens. He said that they will try different things to see what works best yet some poster have no appreciation for this necessary process. Others that have watched him coach 5 different teams in 5 years fully understand and support how he does things. The criticisms of this team and the players will always be part of a forum like this. Sometimes they go too far. But I will say this, you can never be too optimistic about this team. You can never be too positive. Positive thinking is always a good thing and the higher the level the better. Worth staying up for, but man that was ugly for a long stretch. I think the starters are too deferential of one another. Getting every player on the court 4 shots in the first quarter, is not that way basketball works. You have to be more selfish and take your best shot when it appears and when you are hot. Jaylen is a great example. They way her started the 4th quarter is the way he should start every game. Drive hard, use your athleticism and length and dont pass so often. Go at your man- you are better than him in nearly every instance. -Either Brown or Tatum needs to go to the bench and come in refreshed. Brad should start Baynes, Horford, Kyrie and either Brown or Tatum, not both. -If you are going to spread the floor and shoot 3s, the weak side has to crash the boards. Too many one and done's where the whole team is standing around the perimeter, if the shot rattles out it is one and down far too often. -The Celtics really miss Daniel Theis. Sounds silly, but he is a big hustle guy and the second unit is stagnant when he is not playing. Overall, they have a great team and they will get there. Let me check the internets (GWB) for a video that will prove that this highlight was not impressive. down 12 with 3 minutes left. Wow. Love how loud the Celtics fans were. Almost a home game. LOL. At this point I am not sure who should be in the starting lineup. Baynes started 60+ games last year and the Celtics played well. We still do not know for certain if the current starting 5 is the right mixture. I think we have to give it a little more time. Some tweaks could include Morris in at the 4 and Hayward to the bench. I am really starting to think that Hayward is not ready to resume his role as a #2 guy on this team. He is playing better overall but he still appears to be a long way from completing his comeback. I think he has a lot of pressure on him. He will start tonight against his former team. I would not make a change yet but it has to be a consideration. The one guy that you probably cannot replace in the lineup is Jaylen Brown. The reason why I am saying this is because he is our best offensive/defensive option at the two. Tatum and Hayward do not have enough defensive quickness to defend at the 2. Marcus cannot give you offense there and Terry is not big enough. Tatum has been struggling quite a bit on offense. I think he is pressing too much and missing a lot of shots off the dribble. Last year he established himself as a solid catch and shoot guy. This year as he looks to expand his game his first inclination is to put the ball on the floor. He is a very talented kid but he may not be ready to assume the role as our #2 guy. He has taken a lot of good open shots that he missed. Right now his decision making shows inexperience and his shooting is a tad off (timing, release point too far back behind his head, angles, patience) He will be just fine as he works through these nuances. I would not send him to the bench either because Hayward has not won his job back yet but he will have a seat on the bench if needed. There are going to be certain matchups against some teams where we really need Baynes in the game and others where we need a combination of scoring and strength at the 4 (Morris) or a certain defensive skill from a spot starter like Semi or we need 3 wings to push the pace. You are such hypocrites with the use of the word convivial. If I started going after yourself the same way, you'd immediately ban me. So it is okay for you to join the online thread and proceed to spout your Anti-Irving narrative. Sounds to me like you have thin skin. Sounds to me like that crow you are eating got stuck in your teeth. Please do not take things so serious. We are all Celtics fans. Being convivial does not prevent us from having some fun. A little ribbing is never a bad thing. With that in mind, I am introducing a new weekly award to board members. I am going to call it the EAT CROW AWARD. Congratulations you are the first recipient of this award. I am looking forward to winning one myself and every single board member has a crow sitting on the bench. A little humility goes a long way, on both sides of a debate. No ad hominem attacks. Nothing personal. No politics or religion. Vigorous debate and opposing views are welcome especially if supported by evidence and/or argument. Be reasonable in evaluating and re-evaluating your own, as well as other's, conclusions. Show me someone who has never been wrong and I'll show you someone who has never expressed an opinion. I have tons of opinions on a broad range of issues and, therefore, have been wrong many, many times. Being wrong is part of my on-going path to continuous improvement. I can tell you, from personal experience, that crow tastes a lot like chikin. It was a great come-back, gutsy win, etc. But my concern is is it a fluke or a symptom? I hope for the former. I'm talking about the first 3 quarters. As for the glimmers, KI is very close if not is his former self. Also, the most consistent (positive) player, after AH, is Morris, so far. IMO. Sinus last year the Celtics had 2 games where they scored 13 points in the 1st QTR and they won both those games. It was the 1st QTR only that was a nightmare. Great win for the Celts. But the Suns are the 2nd worst team in the league. Something's not right with this current Celts team. We'll know more after 20 games. If the Celts need more losses to realize the team is flawed then so be it. Kyrie is the only star on this team. Tatum and Brown are not stars yet. Hoford's performance so far is not good enough because he's getting 28m per year. And Hayward is struggling to find his place with this team. In the middle of the sky falling on this fatally flawed team, they are in third place with a .636 winning% and 6th best record in the NBA. You dont win championships in November Fierce. If the goal is just to be very good then this current Celtics team is perfect! But if we're talking about championships then this team is nowhere near a championship team. Just last week the argument was this Celtics team is number 1 in defense. Us fans can only talk about the Celtics. It's up to Ainge to do something. Like I said, if Celts more losses then so be it. fierce wrote: Great win for the Celts. Great teams are not built overnight. We have only played 11 games and are 7-4. Yes it will take more time. If Boston went and made a trade tomorrow for example it would take time to integrate that new player or players into the system. This is not like changing out a dead battery. Stevens has an enormous task at hand. But I think we should give him the benefit of a doubt. I know that if a change needs to be made to the roster, Danny Ainge is more than capable of making a deal. These are things you already know. Time will be the final judge. In the meantime I am really enjoying each game win or lose. I expect we will win more than we lose and at some point this team will be in the finals with a great chance to win. mrkleen09 wrote: You dont win championships in November Fierce. 2008 Celts were 13-2 in November and they ended up winning a championship. The point is back then you could see the Celts were a great team. This current Celtics team is struggling to beat even the bad teams. I mean Suns are the 2nd worst team in the league. If Morris missed that game tying 3-pointer in regulation, Celts would have lost. Agree, time will be the final judge. Stevens is more than capable. But he doesn't have the right mix right now. Last season the Celts didn't have Hayward and the Celts were thriving. This season the Celts are supposed to be better because of the return of Hayward. Clearly there is a problem and it can't be solved with more time because Celts have too many of the same kind. Brown and Hayward are redundant. Celts already gave Smart 50m+. That means the Celts will not keep Rozier. No way Celts give Kyrie the max, Smart 50m+, and Rozier another 50m+. Ainge is just waiting for the right deal. fierce wrote: If the goal is just to be very good then this current Celtics team is perfect! You can keep saying the same thing over and over again which reflects a flawed argument. I keep thinking you may come up with some thought provoking revelation. Nope, sos just a different day. I keep thinking you may come up with some though provoking revelation. Nope, sos just a different day. Look at the Celtics record now. Celts are paying Horford 28m per year and Hayward 32m per year and we're supposed to be happy with just being 6th best in the NBA? 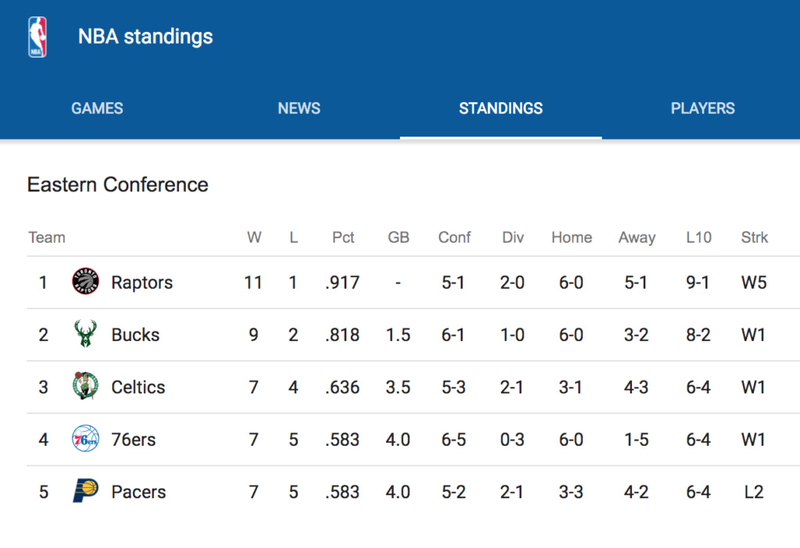 If the Celts are winning and at the top of the east and I keep complaining then that means there's something wrong with me. But the Celts are clearly underachieving. I'm not happy with my Celtics right now. Most of the Celtic fans here said the Celts have enough star players. Doesn't look that way after 11 games. Right now Kyrie is the only star player on this team.